Senior sprinter Jesse Alexander catches his opponent and hangs neck-in-neck with him in a race during the Drake Relays. Alexander was a key team component during the team’s state run. Eileen Crotty Photo. From having the two fastest kids in the state to the 10 other events the Tigers secured at State, ending this season was looking very good for the CF men’s track team. Sophomores James Harrington and Luke Toyosi have the top two spots in the 100 in the state. At Districts, Harrington ran a 10.95 and Toyosi a 10.99, the two going head to head for the number one ranking. Harrington had a false start in his 100, causing a disqualification. Trying to wrangle all this anger into his 200, he was shooting for first in that race. 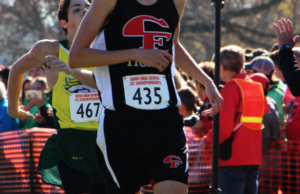 During the run, Austin Ebertowski of Council Bluffs was trying to push past Harrington at the very last second. Harrington held hold of the lead and finished first with a time of 21.92 seconds, beating Ebertowski by .4 seconds. Harrington said this victory felt very good, compared to the false start of his 100. He also added that this wasn’t everything he wanted for this season, but he’ll settle for it, and thought he had a pretty good year overall. 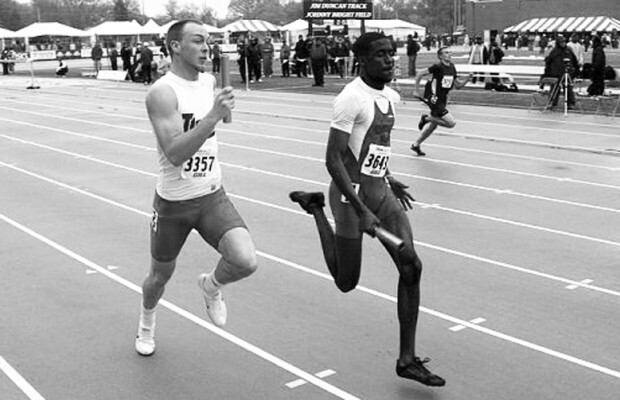 The 4×400 was yet another intense race for the Tigers this Saturday. The team was made up of Marshall Hill, Jesse Alexander, Austin Long, with Jake Jamison anchoring. Jamison was hoping for the win as he rounded the last corner, but he did not see Brennan Davey of Indianola coming right up behind him. Davey ended up passing him for the win, and the Tigers finished the relay with a time of 3:20.56. Jacob Tayloe contributed to the overall ninth place with 26 points for the Tigers this weekend, finishing eighth in the 1,600. Overall, he’s quite happy with the way the season turned out. “I knew we had a good team on paper, so I knew if we ran up to our potential, we would have a good team,” Schmidt said.